This polished, satin-finish ring is one of our most beautiful men's white tungsten wedding bands. When people see the brilliant white color of this 7mm ring, with two polished grooves encircling the face, they will think they are looking at an expensive platinum ring. 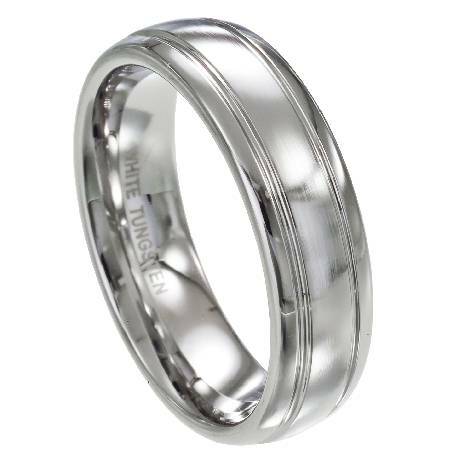 White tungsten wedding bands offer all the benefit s of tungsten carbide - density, durability and scratch-resistance - in a bright white platinum-like metal. Comfort fit tungsten rings usually run 1/2 size larger, it is suggested you buy a half size smaller than your standard ring size. We recommend having your finger measured for a comfort fit ring at your local jewelry store for an accurate fit. All of our tungsten rings come with a lifetime warranty. Wow! The style and look of this ring is so classy. I liked it so much that I ordered another white tungsten band in a different style plus it shipped very quickly! The ring didn't take long to ship, it arrived in perfect shape. My husband loved it. It fits well, sturdy but still beautiful.